Fifty-four degrees for a week was no sweat. Sure, I had to wear my coat around the house, but my bed, once it got warmed, was very warm indeed. It became quite difficult to leave it in the morning. My fingers seemed to move more slowly than usual when I took my gloves off to type in my room. I came to empathize more closely with cold-blooded animals who simply cannot move when the temperature drops too low. J returned first. When I bragged that I had passed his challenge, he was surprised. He told me that he had never meant to challenge me. He thought that I was leaving for the break as well and that he was cooling what would soon be an empty house. When Nate came back he told me that it’s illegal to heat a mine shaft less than 55 degrees, and miners have gone on strike for less than what I did to myself. Now let’s fast-forward one year. J and Nate switched rooms and now Nate was beside the kitchen and J was next to me. With respect to my newly proven ability to withstand cold temperatures, J made 54 the standard house temperature. Fortunately, the weather had not yet gotten that cold even outside. Then the Polar Vortex hit. Duke Energy sent out an email asking us to all try and conserve energy, so J, as any good citizen would, did so. The catch was that he used the current temperature of our house – 54 degrees – as the baseline, so he put the temperature down to 48 degrees. Nate was to come home shortly, at which point J and I agreed that 48 degrees would not fly, so I was happy to do my part to help keep Duke Energy from being overwhelmed. I solemnly donned my long-johns, sweater, subzero-rated jacket with the hood up, three pairs of socks, earmuffs, and ski-mask and shivered violently on my couch, secure in the knowledge that I was doing the right thing. First of all, let me present a picture, since it is now an easy thing for me to do. 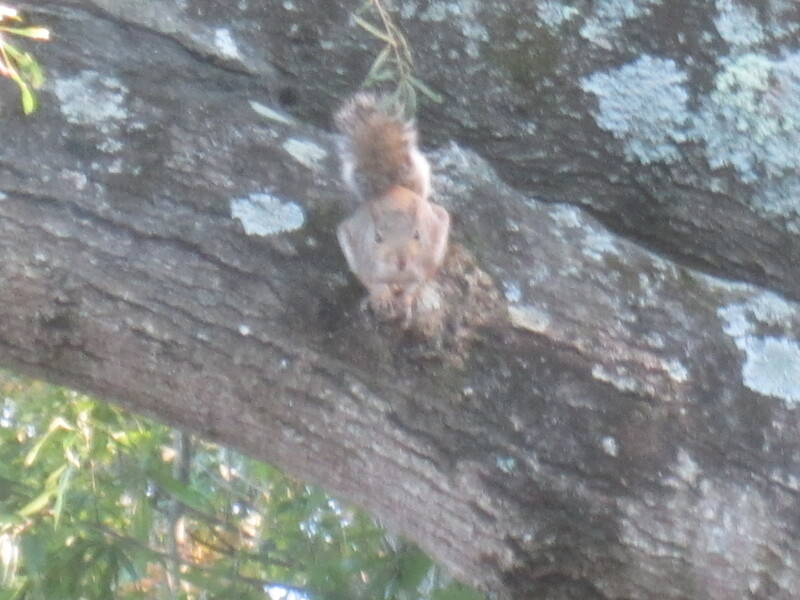 A squirrel I mentioned in an earlier post. Notice how he has found a particular spot on the tree where he can perch and stare directly at me for minutes at a time. Now that that’s out of the way, let me tell you about a package I got from one Ulf Hellsten of Winston Salem, North Carolina. I have never met Ulf, but I received a package from him yesterday nevertheless. It contained no notes or letter of any kind, only a DVD-R in a case with the hand-written title “ZERO 9/11.” As one might expect, the movie was about the conspiracy theories surrounding the 9/11 attacks. At first looking at this movie it almost seemed like I wouldn’t be able to play it at all, but eventually I got it to work by switching to a different media player on my computer. Watching it on the DVD, you can see tracking lines like it was originally edited on VHS, and there are brief moments of blue where the film was cut together. Sometimes the film repeats entire minutes of interviews. Other times to provide emphasis it replays someone’s most important words again immediately after they finish speaking. This makes the documentary seem briefly more like a techno song. Currently the theory of why this was sent to me is that Mr. Hellsten saw my letter to the editor on Syria and decided that I might be receptive to his film. Because the News and Observer does not publish submitters’ addresses, Ulf probably found my address on my resume, which is posted online. This is my permanent address, which is at the moment my parents’ address, so the video was sent there. I have a return address, so now I just have to decide if it’s worth my time to find an envelope and stamps to mail this guy my email so he can tell me if my theory of why he mailed me this thing in the first place is correct.